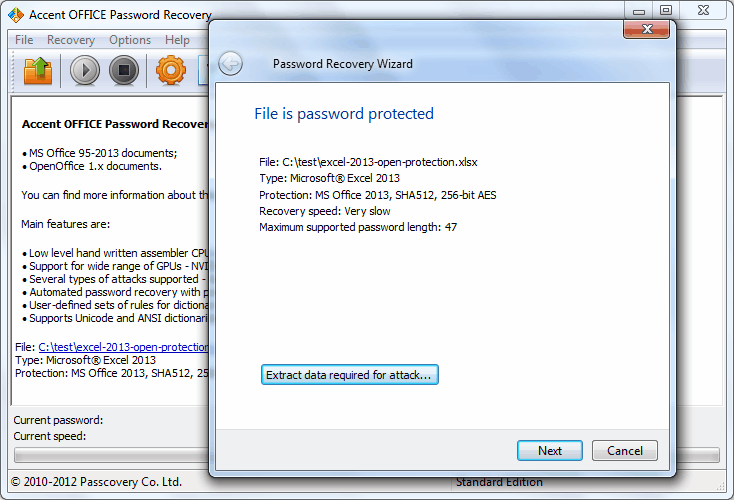 Found 2 file extension associations related to Accent OFFICE Password Recovery and 2 file formats developed specifically for use with Accent OFFICE Password Recovery. If you have lost or forgotten a password for opening a Microsoft Office document (Access, Excel, Word) or a password for saving changes to a Microsoft Word document, you can use this software. It will help you! To search for a password more effectively, the software offers you to choose one of the three ways: a dictionary-based attack, a brute force attack or a brute force attack with a mask. Also, the software finds some passwords at once! If you need more information please contact the developers of Accent OFFICE Password Recovery (AccentSoft), or check out their product website.